Business intelligence (BI) is an umbrella term that refers to a variety of software applications that is use to analyse an organisation‟s raw data. It is fundamentally concerned with transforming your organisation‟s operational data into an available store of valuable information also known as data warehouse. It is also concerned with distributing the correct information in the right way, at the right time. BI is made up of a number of connected actions. Including data mining, business value intelligence, decision making and so on. Thus a BI system can be called as a „Decision Support System‟ (DSS). Business value is a casual word that includes all types of value that determine the welfare of the company in the long-run. In this unit, „Business value‟ of an investment is calculated as the net current value of the after tax cash flows related with the savings. For example, the business value of an asset in an industrialised plant is the sum of the incremental after – tax money flows linked with the sale of the goods produced at the plant. In this section you will be familiar with the definition of BI also the application involved in it. Business intelligence (BI) is a wide category of applications and technologies which gathers, stores, analysis, and provides access to data. It helps enterprise users to make better business decisions. BI applications involve the activities of decision support systems, query and reporting, online analytical processing (OLAP), statistical analysis, forecasting, and data mining. · Mission-critical and important to an enterprise’s functions or occasional to meet a unique requirement. · Enterprise-wide or restricted to one division, subdivision, or project. · Centrally started or driven by user demand. Business Intelligence is a term used to refer a number of activities a company may undertake to gather information about their market or their competitors. · Enterprise Reporting and Data Mining. Business Intelligence (BI) is a managerial concept which helps mangers in the organisations to manage information and make factual decisions. This idea has become a popular movement for businesses concerned in adding value to their decision making processes. The 20th and 21st century is known as the information and technology age. Before the beginning of information age, it was very difficult to access any information in the absence of computing method. So, all the business decisions were largely based on instinct. But in today‟s modern globalised world, the application of Business Intelligence technology is becoming popular day by day in almost all kind of businesses. In 1989, Howard Dresner4 proposed BI as an umbrella term to describe “concepts and methods to improve business decision making by using fact based support systems.” It was not until the late 1990‟s that this usage was widespread. 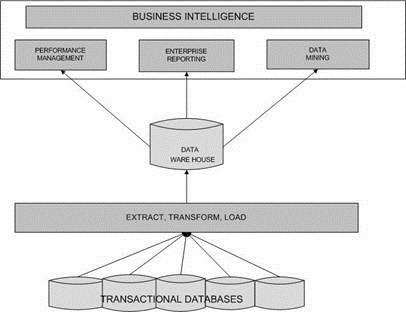 BI concepts along with Data warehouse technologies, well developed enterprise application tools and Online Analytical Processing (OLAP) assists in faster collection of data research. The Technological advancement makes it easy to obtain huge amount of data in a less time and computing resources makes it easy to analyse data for long term planned decision making. Hence with growing competitions in market, small to large organisations are adopting BI to understand the economic trends and have an in-depth knowledge about the operation of a business.